Use in the kitchen to replace scrapers, steel wool and metal sponges. 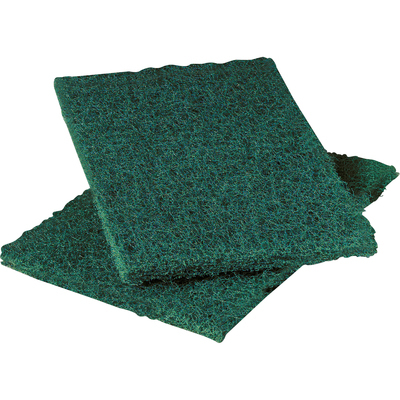 Tough fibers and abrasives clean grills and ovens and remove baked-on food from pots and pans. Scours cookware, scrubs floors, and cleans kitchens and cooking equipment. Made with durable synthetic fibers, abrasives and resin. Resists degradation from exposure to hot water and detergents. Can be used wet or dry. Can be used wet or dry. Tough synthetic fibers, abrasives and resins clean grills and ovens. Removes baked-on foods from pots and pans, replacing scrapers, steel wool and metal sponges. Also scrubs floors, and cleans kitchens and cooking equipment. Can be used wet or dry.